With family and friends, stressed, looking for a weekend escape? Summer or winter Berrara is the place to be. Pamper your partner with a romantic dinner before retiring to the two person spa with the glass roof. Sip your champagne in the warm spa while gazing at the stars through the glass ceiling. After the spa curl up in front of the gas log fire and enjoy the outlook, the only noise, the rumbling of a breaking surf. Alternatively sit on the balcony in front of the magnificent ocean and national park views and read a book or take a walk and meet the kangaroos. Leave the phone and computer at home and just enjoy luxury and nature. 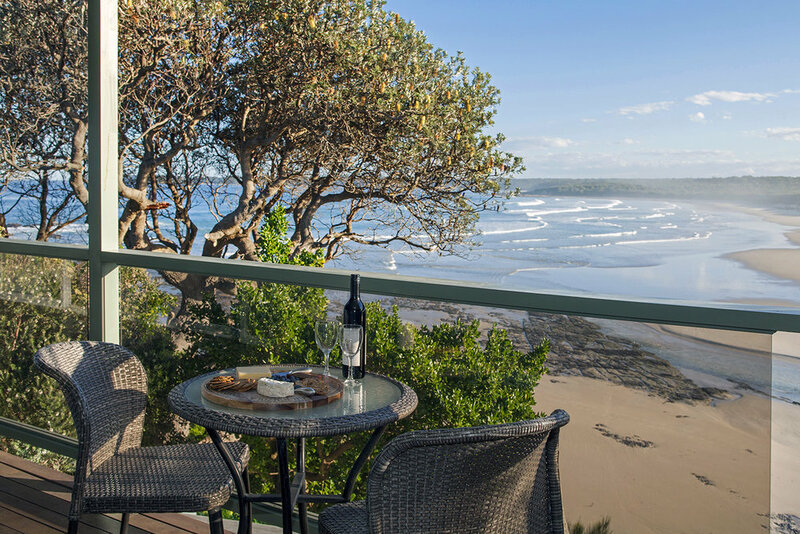 Situated on one of the most beautiful and peaceful headlands of the south coast of NSW, Berrara Beach Chalets incorporates fantastic accommodation options combined with uninterrupted views of the Pacific Ocean, Berrara Beach or Berrara Lagoon. Our Oceanfront Deluxe Chalets are positioned around the eastern and southern tips of Berrara Headland to take advantage of the different outlooks provided by spectacular coastline. Our hidden secret. Both our Headland Chalets are situated on the tip of Berrara Headland and have unequalled views over the Pacific Ocean onto Berrara Beach. Lagoonfront Executive Chalets overlook beautiful Berrara Lagoon and take advantage of the fantastic sunsets over Conjola National Park. "What a beautiful location, well worth a visit. The extremely well equipped Chalets offer magnificent views either out to the ocean or down along the beach. The spa was an added luxury, especially with the skylight above it so you could star gaze in style...with the beach right outside your door and a short stroll to the Berrara Lagoon Inlet, who could ask for more. Little ones could play for hours in the very calm waterways or build sand castles to their hearts content in the soft white sand...a very relaxing holiday" - Tripadvisor.